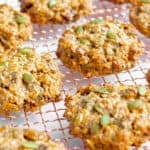 These cookies are packed full of goodness and are perfect to make ahead for busy weeks. They are completely customisable and can be thrown together in only 30 minutes! Healthy, GF & vegan option. Preheat the oven to 160°c fan/180°c/350°f and line a baking tray with parchment paper. Blitz 50g (½ cup) of the oats in a high speed food processor to a flour. Mix the oat flour, rolled oats, seeds, chia seeds, dates, cinnamon, baking powder and salt together in a large bowl. In a smaller bowl mix together the honey/maple syrup, tahini, coconut oil, vanilla and egg until combined. Pour the wet ingredients into the dry ingredients and mix everything together well. Use an ice cream scoop or spoon to scoop 12 balls of the mixture onto the lined baking tray. Using your fingertips, lightly flatten each one into a 1/2 inch thickness. Bake the cookies in the oven for 15-18 minutes or until golden brown. Transfer the cookies to a cooling rack and allow them to cool completely before storing in an airtight container. Why not make a double batch of these cookies and freeze half for weeks to come? Make these cookies your own with your favourite ingredients. You can swap the tahini for any nut butter you like, use any mix of your favourite seeds (do not change the chia seeds - they help to bind the mix!) or swap the dates for any dried fruit you fancy. Gluten-Free: Make sure you are using GF certified oats and baking powder. Vegan: Use maple syrup rather than honey and a flax egg. If you do not have a food processor to make the oat flour you can use either 50g of shop brought oat flour or regular flour instead. When buying tahini have a look at the label to make sure it is 100% sesame with no added oils or preservatives. I personally buy this one.